On April 30th, 2017, 412 Toronto Street suffered a major fire. Thankfully, everyone escaped safely but the house will have to be demolished. 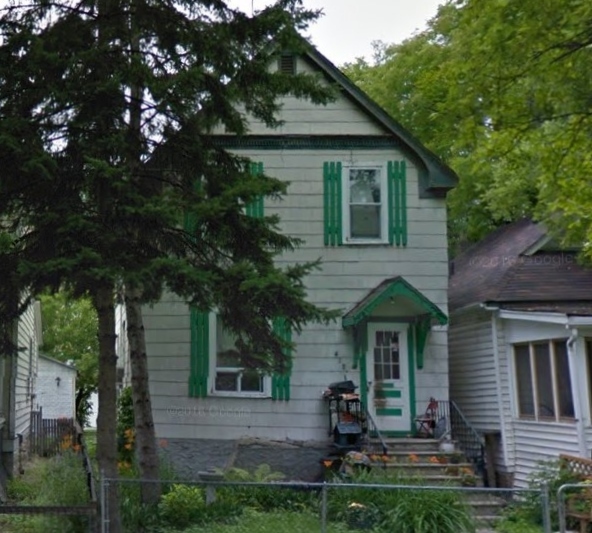 Before it is gone, I thought I would take a look back at what was one of the oldest houses in the West End and, remarkably, was home to just two families in the past 104 years. The building permit for 412 Toronto was issued in 1894 making it one of the West End's older homes. At the time, the West End west of Maryland Street was little more than an agricultural outskirt of the city. 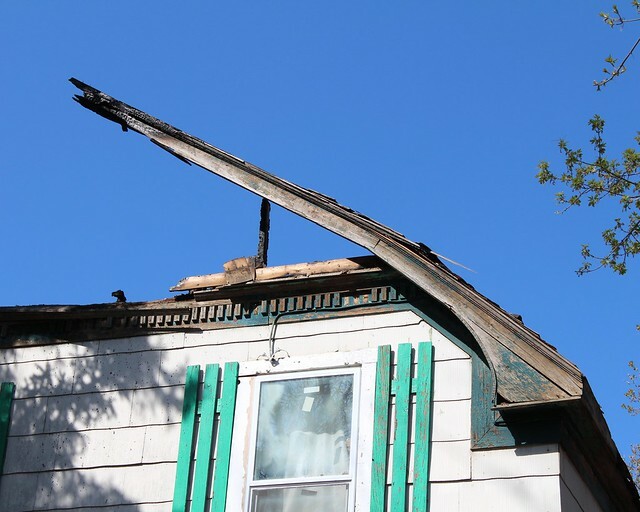 Most homes and other buildings were not constructed until after about 1904, when the city began subdividing the area by grading roads and installing boulevards, sidewalks and water. 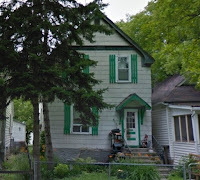 The first Henderson Directory listing for this address comes in 1901 with Richard Owens, labourer, listed as homeowner. In 1902, it was owned by Andrew Walmsely, labourer, with Richard B. Stone, a bricklayer, and his wife renting a room. By 1912, it was home to James E Adams a, traveling salesman. The first long-term owner came in 1913 with the Cleven Family. Endre Johanssen Cleven was born in 1874 in Skudenes, Norway. At age 17, he settled at Inwood, Iowa and then New York City, where he studied music. 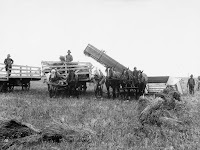 In 1912, Cleven was employed by the Dominion Immigration Office as the Scandinavian immigration agent for the U.S., essentially a "homestead finder" for immigrants looking to move north of the border. It was a job that kept him on the road a lot. As for his home life, Cleven married Margit (Margaret) Hoines on June 9, 1904 in Winnipeg. She, too, was from Skudenes and arrived in Winnipeg in 1903, so it is likely that she came back with him after his visit home. The couple had as many as five children; Euare (1906), Harald (1910), Olf (1912), Odvar (1916), and Lillian (?). An infant daughter - presumably Euare - died in 1907. Also listed in the Henderson Directory for their first couple of years residing at 412 Toronto is Aadni Hoines, Margit's brother, and his wife. He was a carpenter by trade who worked as a cabinet maker at Eatons. 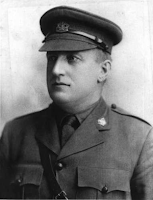 When World War I was declared, Cleven was already a lieutenant in the 90th Regiment, Royal Winnipeg Rifles militia. He also had previous war experience, noting on his Officers' Declaration papers that he had spent 4 years with the U.S. Army, which included the Spanish American War and a tour in the Philippines. 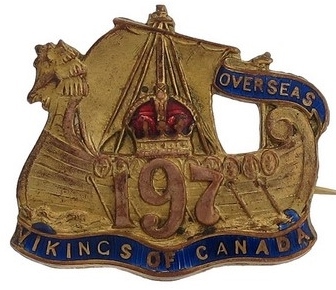 Given his connections in the Scandinavian Community and his rank in the 90th, Cleven was made the Quartermaster in the newly-created 197th Overseas Battalion, nicknamed the Vikings of Canada. On July 3, 1916, Cleven and Lt. Col. A. G. Fonseca, the commanding officer of the 197th Battalion, were to visit Camp Hughes where their men were soon being sent to train. They stopped at the Cleven household to have lunch before embarking. At about 4:00 pm the men were driving three miles east of High Bluff, Manitoba, near Portage la Prairie, when the driver, who was only doing about 16 miles per hour, swerved to avoid a pothole. The car touched the shoulder and ended up hitting the ditch. Cleven was thrown from the vehicle and killed. The driver and Fonseca were unhurt. Cleven would never meet his youngest child. Mrs. Cleven was left to raise the children, who attended John M. King School. Margit was very involved in the First Norwegian Church / Our Saviors Lutheran Church and other community activities. In 1925, she was part of a Canadian delegation to conference in the U.S. to commemorate the 100th anniversary of Norwegian immigration to North America. Margit never remarried and lived at the home until 1960 along with long-term renters Agnes and Emmanuel Hanna. Margit died on January 18, 1965 and is buried at Elmwood Cemetery. The next long-term tenants were the Luba family, who moved in in 1960. Stephen Luba of Angusville and Mary (Derlago) of Rossburn were married in Angusville in 1936 and farmed in the area until they moved to Toronto Street. The couple had four children; Adolph, Lawrence, Stephanie and Randy. On first arriving in Winnipeg, Steven worked in the warehouse at Dalewood Transport then for Federated Co-op. By 1965, he was the elevator operator for the Building Trades Association in the Grain Exchange Building. He died in 1983. Oldest son Adolph got a job as a diver for Brooke Bond Ltd., makers of Blue Ribbon. In 1970 he went to Belleville, Ontario to become production manger at their new factory. He died in Calgary in 1990. Mary Luba remained in the home until her death in in 2002 at the age of 87. It was still occupied by a descendant when the fire broke out on April 30, 2017. Thanks for the informative history regarding this house. My grandparents on my father's side of the family knew Margit Cleven well. I have inherited many photos of my grandparents and my father with Clevens, Hoinesses, Sandbergs and Hilleslands from the Norwegian Lutheran Church in Winnipeg. They appear such a close knit group and I can remember a few of them, but not Margit. I must have been too young. 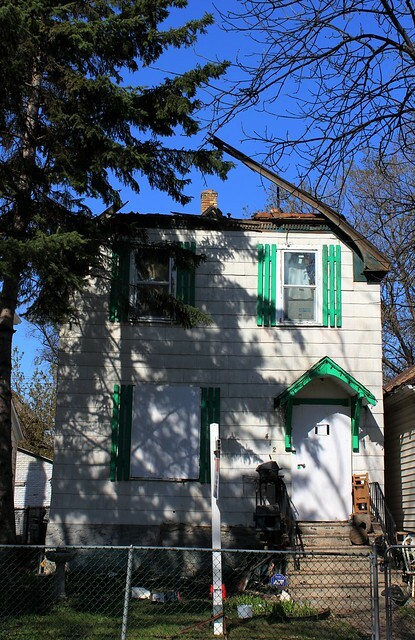 My grandparents lived a few km away at 1862 Assiniboine Ave and later moved to 997 Warsaw Avenue, but my early life was in St. Boniface. Last summer I brought my family to visit Winnipeg, which I had not seen since moving away in 1966 while in grade 4. It was a great history lesson for my son. I'm Endre & Margit's great granddaughter, Jacqueline. My grandfather was Harry Cleven. I'm sorry I didn't get a chance to see their house before it was demolished. Thanks for posting this info! I'm Endre and Margit's grandson Mike, and I have various photos of gatherings of grandma with others who I have no idea who they are, other than Uncle and Jenny (Uncle being how I grew up knowing Aadne, though he was my great-uncle). If you email me at [myname] at gmail dot com I'll send you what I have. I'd be interested in seeing what shots you have of the Clevens other than Grandma; my dad was Endre, the eldest. I have a few but not many shots of his siblings. for the benefit of others reading this page and also for the Winnipeg blogger who posted it, it's worth saying who was raised in that house and what became of them. For the blogger, if you want to contact me, I have group shots in front of the house of all the siblings and also of my Dad playing fiddle at some outdoor party in a Winnipeg residential area in the '30s in front a big house with a lot of guys, and also shots of him playing rugby and of the Winnipeg rugby team he played for.....you'd be able to know where such shots were, and also a lot of beach shots I have from what must be Lake of the Woods or up at Slave Falls, though some of Winnipeg Lake Beach, whatever it's called. Anyways, the Cleven kids are a whole story in themselves. My Dad became a boxer and also a billiards champion (kinda famous one, when he came back for Grandma's funeral in '64 my cousin Jim told me they had to bring bleachers into the pool hall up the street from 412 Toronto, as so many people wanted to see Dad play again... he could do all kinds of tricks, making the ball jump and such... and told me he once played with Minnesota Fats, and during his thumb-breaking days with the mob in the rum-running years he was around Chicago and Milwaukee a lot, and told he me he met Al Capone once. And that's just Dad. Lillian was a showgirl and became Miss Canada 1930 - I wish I had more pictures of her and knew about her career in her youth, as the '20s and '30s were an amazing time in showbiz anywhere. She "married up" in Chicago after divorcing her first husband, Norm Kierland, and became private secretary to the County Clerk of Cook County i.e. part of Mayor Daley's Democratic Party machine. Alf (Alfred) did very, very well for himself....ending up as Chief Factor of the Hudson's Bay Company with his name so well-established in fur markets worldwide. So well-established that when he died, the HBC came to my cousin Jim, Harald's oldest son, who was sales manager for Playtex Canada's western division, to ask him to take over Alf's job... they wanted him bad, but Jim said he didn't know anything about furs and let the opportunity go (Jim, you were a fool, buddy, man what I'd have given for that gig LOLOL). Odvar, who like my Dad had no high school education, nonetheless became an aerospace engineer and worked for De Havilland and Canadair, and worked on the Avro Arrow. Then there's Harry, Harald Cleven, who was Dad's favourite brother and who died when I was only one on on the frozen basalt buttress of Mount Slesse during a thunderstorm, the plane smashing into it, following the wrong beacon and with the pilots only seeing the mountain-face as they were about to smash into it.... the date was December 6, 1956, and among the dead on the flight were most of the Winnipeg Blue Bombers and their major supporters, who included Uncle Harry. WestEndDumplings, Winnipeggers might be most interested if you to research and write about Harry, as he was president of the Manitoba YMCA and also the Manitoba Rotary and I don't know what else.....his son Jim and daughter Sue Hoplock are still alive if you'd like to find out details from them about him, though there must be lots in Winnipeg's newspaper archives; his youngest, Jeff, the youngest, who did the first loft-space redevelopment in downtown Winnipeg and worked as for major pension funds, died a few years ago. So those are the kids who grew up at 412 Toronto. Grandpa I've been in touch with the Office of Persons of Canadian National Significance about, and they agree he qualifies but wanted more documentation. This article of yours is a piece towards that end, and thank my cousin Kris (Odvar's grandson) who sent it to me. And WestEndDumplings...something Jim and I were curious about that maybe you could go ask about for me/us: - Dad's old pool hall had recently become a mosque when I was there in '07.... tout ca change- but we got wondering what they'd done with the old pool table... did the imam take it home or is it in their masjid's community hall - or is billiards contrary to the teachings of the Prophet? I'll bet it was as super-nice pool table... and I do wonder if the family piano was still in the house when the next family bought it, or where it went when Grandma left the house.